KUALA LUMPUR: Tun Dr Mahathir Mohamad has continued to repeat old, unproven and unsubstantiated allegations based on what he himself admits are assumptions instead of evidence, according to 1Malaysia Development Berhad (1MDB). 1Malaysia Development Berhad (1MDB) in a statement here today said this was despite detailed and factual clarifications being issued by 1MDB and "the fact that Dr Mahathir has repeatedly been proven wrong in his claim that RM42 billion went missing from 1MDB". "Unlike Tun (Dr) Mahathir, who relies on assumptions, 1MDB prefers to deal in facts. It is a fact that 1MDB accounts are audited by reputable, international firms. It is a fact that anyone can easily verify 1MDB facts and figures by reviewing the publicly available, audited accounts," said the statement. The statement was in reference to the latest blog post by the former prime minister. 1MDB said that through his statements, Dr Mahathir clearly shows his contempt and disdain of the various agencies that were investigating 1MDB. 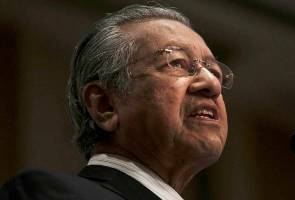 "After 22 years in power, in his mind, only Tun (Dr) Mahathir can be right. This is despite him being proven wrong on 'the RM42 billion hilang' (RM42 billion missing) allegation and meekly confessing to not having evidence, when asked whether he would lodge a police report against 1MDB," the statement added. The statement also said it was a well-known fact that the Auditor-General has been tasked by the Cabinet on March 4 to review the past accounts of 1MDB. An interim report was presented to the Public Accounts Committee (PAC) on July 9 and a final report will be presented to the PAC which comprises both government and opposition Members of Parliament on December 17. "1MDB is and continues to be the most investigated company in the history of Malaysia. We have cooperated fully with the lawful authorities which include the MACC (Malaysian Anti-Corruption Commission), PDRM (Royal Malaysia Police), BNM (Bank Negara Malaysia), the National Audit Department and the PAC," it said. It added that documentary proof and evidence had been submitted to these lawful authorities and each of these lawful authorities had independently conducted investigations and publicly issued statements relating to 1MDB. "If Tun (Dr) Mahathir is interested in the truth, he would allow these agencies to complete their investigations and await their findings. However, rather than do this, Tun (Dr) Mahathir continues to freely make unproven allegations without any investigation, without any reference to facts, and without any regard to the rule of law and due process," the statement concluded.